TO: Tower Automotive Milwaukee Union Retirees Under Age 65 who were eligible for retiree health insurance under the Tower Automotive benefit plan and the union's collective bargaining agreement. In the Tower Automotive bankruptcy proceedings, Tower ceased providing health benefits to retirees under age 65. Tower provided limited funding to establish a Voluntary Benefit Association (VEBA), known at the Tower Automotive Milwaukee Union Retiree Benefits Trust (TAMU Trust) which has provided health benefits to participating retirees under age 65 since July of 2006. Unfortunately, the TAMU Trust's funds are too low to maintain the TAMU program of benefits in 2010. The TAMU benefit program will not pay benefits for health care provided after December 31, 2009. The TAMU Trust will pay benefits for participants incurred before January 1, 2010, provided medical bills are submitted on or before March 31, 2010. The Wisconsin state legislature has made available the Badger Care Plus Benchmark program to former Tower Automotive Milwaukee Union employees who were eligible for pre-65 retiree health benefits. This is not a free program. Participants must pay the applicable premiums for the Badger Care Plus Benchmark program. Current participants in the TAMU Trust program will receive packets of information concerning enrollment in the Badger Care Plus Benchmark plan. If you were eligible for the Tower pre-65 retiree health benefits, but are not a current participant in the TAMU Trust health benefit plan and you lose your current health benefit coverage, you also may be eligible to participate in the Badger Care Plus Benchmark plan. If you lose your current health benefits and you were eligible for the Tower Automotive pre-65 retiree benefit you may contact the Wisconsin State Department of Health Services at (608) 266-6740 to determine your eligibility and if eligible to receive a packet of information. I have been informed that NY Life mailed out the distribution forms this week to all the remaining participants in the old Tower Automotive Union 401(k) Plan. Participants have until November 30 th to complete the forms and return them to NY Life. The NY Life mailing address is on the form. All plan assets will be distributed by December 31st. Participants who do not respond will have their balance placed in an IRA at NY Life. Tower has gotten permission from the IRS to terminate the old 401 (k) plan. A communication will be mailed by NY Life to the remaining participants the second week of August. According to NY Life, there are 675 participants in the old union plan. All funds must be distributed by November 30, 2009. Participants who do not respond or cannot be located will have their account moved to an IRA at NY Life. The ERISA settlement has been distributed to participants who held shares in the Tower stock fund between August 3, 2001 and January 31, 2005. On July 21st, the settlement was deposited in to their accounts in the old 401(k) plan. Because the old plan has been terminated it will be necessary for participants to receive a distribution (lump sum or rollover). On Friday NY Life mailed a communication about the settlement to participants. These participants will also receive the communication I mentioned about concerning the plan termination. Participants with questions about the settlement should be directed to The Garden City Group at 1-800-951-2103 through September 30, 2009. A class action suit was filed against Tower Automotive, Inc. NYSE:TWR, and a certain number of its officers and directors, by stockholders who held the company's common stock between August 3, 2001 and January 31, 2005. If you are a member of the Settlement Class because you held shares of the Tower Automotive Stock Fund under the Tower Automotive Retirement Plan or the Tower Automotive Union 401 (k) Plan ("prior Tower Plans"). The Tower Automotive Products Savings Investment Plan and the Tower Automotive Products Employee 401 (k) Savings Plan were also part of this action, but were merged into the Tower Automotive Union 401 (k) Plan on December 20, 2006. The allocation of the settlement was recently approved by the Court. During July your portion of the settlement if you had one, was deposited into the account you held in prior Tower Plans, and invested in the Stable Value Option. You can redirect the investment of your account at any time via Benefits Complete. Benefits Complete can be reached at this number: 1-800-294-3575 to request a distribution package in advance. Please contact the New York Life Participant Service Center at 1-800-294-3575 if you have any questions regarding your distribution options. Please contact me if you have any questions I may be able to help you with. Attention Anyone that was in the VEBA - TAMU Trust - Benestar program. In the budget that was signed this past week, there was an amendment— "Senator Spencer Coggs Budget Amendment #1 Tower Automotive" included in the 2009 Wisconsin Act 28 the Budget Bill. It was successful through the efforts of many people who we are very grateful for and appreciate their efforts very much. This legislation will allow those who have been covered by the Tower Automotive Milwaukee Union (TAMU) VEBA and are not yet age 65 to purchase coverage from the Badger Care Plus Benchmark Plan. This is not a free program. Anyone who decides to participate will pay the premium of the coverage, but we anticipate it will be a reasonable price. This has been arranged because VEBA will not be able to provide benefits next year in 2010. We do not yet have the details of how much the coverage will cost, how to enroll, or the details of who will be eligible. We will be working with the Wisconsin Department of Health and Family Services to get this information out. The individual lost his or her employer - sponsored health care coverage as a result of his or her employer's or former employer's bankruptcy. After losing his or her employer - sponsored healthcare coverage, the individual received health care coverage through a voluntary employment benefit association that was established before August 2006. The individual is not other wise eligible for coverage under this section. The individual is under 65 years of age. We will be getting the information out as soon as we get it. Recently, Tower sent out the annual pension notices to everyone. 1. The notice is a model Annual Funding Notice which the company has completed with information that pertains to the Tower Automotive Consolidated Pension Plan. The language on PBGC is standard information IRS wants out in the public. It does not imply there is a problem with the pension plan or that it is under funded. 2. As of the funding target attainment percentage date reflected in the notice, the plan did not appear to be particularly at-risk at the time (83%). There is a funding shortfall, however. The company generally has the obligation to move the funding target attainment percentage toward 100%. 3. The Annual Funding Notice shows a difference between the actuarial value of plan assets as of 1/1/08 and fair market value of assets as of 12/31/08. There are two reasons for the difference, first the market value is a year later, after the stock market fell substantially, and secondly, actuarial value usually includes some smoothing of asset price variation. That is the actuarial value is not as high as the top of the market or as low as the bottom of the market. When the value of assets goes down, there may be an additional legal obligation for the administrator to contribute, depending on the amount the asset goes down. If you have any questions please feel free to give me a call and I will try to get an answer for you. Recently documents were sent out to all former employees of Tower Automotive who had purchased and held shares of Tower stock over several year periods. If this applies to you, you may want to complete a Proof of Claim and Release provided with the documents. Completing the Proof of Claim and Release does not assure that you will share in the proceeds of settlement in the Class Action. "TO; ALL PERSONS WHO PURCHASED OR ACQUIRED TOWER AUTOMOTIVE, INC. ("TOWER") COMMON STOCK AND/OR 6.75% TRUST CONVERTIBLE PREFERRED STOCK BETWEEN DECEMBER 21, 2000 THROUGH FEBRUARY 1, 2005, INCLUSIVE (the "SETTLEMENT CLASS"). There will be a fairness hearing on the proposed settlement May 27, 2009 in New York. To Participate in the distribution of the net settlement fund, you must timely complete and return the Proof of Claim and Release form that accompanies this notice. Notice regarding electronic files: Certain claimants with large numbers of transaction may request, or may be requested, to submit information regarding their transactions in electronic files. All claimants must submit a manually signed paper Proof of Claim form whether or not they also submit electronic copies. If you wish to file your claim electronically, you must contact the Claims Administrator at 1-866-907-1965 or visit their website at www.gilardi.com to obtain the required file layout. No electronic files will be considered to have been properly submitted unless the Claims Administrator issues to the claimant a written acknowledgment of receipt and acceptance of electronically submitted data. Please Do Not Telephone the Court, The Clerk's office or any of the Defendants Regarding this. If you did not get this notice and you feel you should have because you purchased stock during this period, you can contact one of the attorneys listed to get the appropriate paperwork. Tower has filed an application on July 8, 2008 with EP Determinations, Internal Revenue Service - this is for an advance determination as to whether the plan meets the qualification requirements of 401 of the Internal Revenue Code of 1986, with respect to its termination. I have contacted Tower and asked that advance notice be sent to everyone that is still in the plan and to have explain the options available to people in the plan. Quote from Tower, "Any former colleague of Tower with an account balance in the 401(k) plan can request a distribution (lump sum or rollover) at any time from NY LIfe. Once the IRS approves the termination of the plan then it will be necessary for any remaining participants to move their funds. The termination process can be lengthy so it is not necessary for them to move their funds immediately but it would be wise for them to start making arrangements." Please just be very careful when making these types of disbursements. Go to your financial institution and have someone with expertise help you, as there may be very dire consequences (taxes and penalties) associated with these types of moves. Any questions please free free to call me and I will help you if I can. On the Insurance front, we have been working very hard and meeting with different people and trying to set up something to morph the plan that will terminate in December 2008. I will keep you posted and try to get the information out to every one as soon as possible. We have been notified by Tower Automotive Retiree Customer Help Line, that they are replacing Sun Life as the Insurance Company, Tower decided to have Metropolitan Life Insurance Company provide life insurance coverage effective March 1, 2008. They have assured us that "There is no action required on your/our part", Your current elections, coverage amounts and beneficiaries will stay the same. If any one has any question regarding the life insurance program, please feel free to contact the Tower Automotive Retiree Customer Service Help Line at 616-802-1543, or you can call me at 414-871-2460 and leave a message and I will get back to you as soon as possible. On Monday August 21, 2007 I received a letter from "OPPENHEIMER", I imagine it was sent to everyone that still has an open account in Tower Automotive Union 401(k) Plan. In the letter it states that,"With the recently announced changes affecting the Retirement Plan, you are faced with important decisions about what to do with the savings you have accumulated in the Plan." Well, there were no recently announced changes and that does not mean they may in fact be coming, but not yet and we don't know what they will be and the current Tower Automotive Retirement Plan will not be terminated very soon as indicated. "Recently, participants may have received a letter from Oppenheimer related to the 401(k) plan accounts under Tower Automotive. Participants received the letter because they no longer actively work for Tower and continue to have an account. Oppenheimer performs investment advisory and educational services on behalf of the retirement plans. As part of their services, from time to time they will mail communication to the homes of terminated participants with active account balances, and offer complimentary appointments to discuss participant retirement goals and options. Tower does not know when the retirement plans will file an application with the IRS to approve the plan's termination, and it could take 12 to 18 months from the date of the filing with the IRS before the IRS reviews or approves the termination. Participants will be notified when the plan files the application with the IRS. If the IRS eventually approves the termination, the plan will notify participants before processing a distribution. Of course, terminated participants may elect to receive a distribution, or transfer their accounts to another qualified plan at any time, by contacting www.bcomplete.com, the administrative web site available to all participants." So, there is time and no need to stress about this immediately, but just let me caution you on one thing, IF YOU TAKE A DISTRIBUTION FROM A PLAN SUCH AS THIS - IT MAY CAUSE HUGE TAXABLE CONSEQUENCES FOR YOU. So, make sure if you are about to do something with any type of account like this seek advice. If you have any questions that I may help you with please feel free to give me a call. Kathleen Ligocki is stepping down after being CEO for four years and taking a consulting job with Cerberus, with an announcement coming at the end of the week according to "Tower spokesman Joe Kirik". Tower emerged from Chapter 11 bankruptcy protection today, 185 pension fund intact - according to the PBGC. "PBGC Interim Director Charles E.F.Millard said in a news release. Tower Automotive and its asset purchaser, Cerberus Capital Management, are to be commended for keeping this commitment to their workers' retirement security." If we get any news of any up coming changes in addresses or suppliers of benefits we will forwarding to you. Please remember that if you move - please supply them with a correct address and a means to be able to get ahold of you. You can also use this email address for: Human Resource Inquiries, Address Changes, Employment Verifications. The Bankruptcy Court for the Southern District of New York approved the Amended Settlement between Tower Automotive and its subsidiaries, TA Acquisition which is purchasing Tower's Assets ("Purchaser"), the Milwaukee Unions and the Smith Steel Workers DALU 19806 Litigation Trust, after a hearing in New York on Thursday June 28, 2007. The Court noted there were no objections to the Amended Settlements. The Amended Settlement was important because it provided that the Purchaser will assume the pension plan and will not amend the Milwaukee pension benefits. The Purchaser also agreed to maintain retiree life insurance benefits. It will fund the VEBA, but only through 2008. Our website posting of June 20, 2007 has further details on the Amended Settlement. The Court also ordered that the Smith Steel Workers DALU 19806 Litigation Trust is the authorized representative of retirees who were represented by Smith Steel Workers DALU 19806 "in accordance with 1114 of the Bankruptcy Code". Under the Amended Settlement Tower will be distributing the NLRB Transmarine remedy payments which were negotiated a year ago to employees who worked under the 2003-2009 labor agreement between Tower and Local 19806. These employees were affected by Tower's refusal to bargain over the effects of the shutdown of the Dodge Ram work after the 2003-2009 agreement was negotiated. We expect checks will be mailed out by certified mail next week. Any questions please call me at 414-871-2460. This photograph hung in Executive Boardroom of the 19806 Memorial Hall for many years. 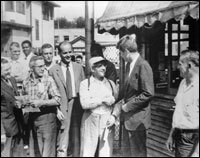 It was taken in 1959 when Senator John F. Kennedy was running for President. Also in the photo is William Proxmire and Clemet Zablocki. We don’t have a record of who the other people in the photo are. If you’d like a copy of the photograph, you can download a copy of it here. It is a large file so I reduced it into a “zip file” which will be faster for you to download. You will need an “unzipping” utility to open up the photo. Then you can print it.